The past decade has seen its fair share of amazing alternative and indie rock music – bands and individuals who came out of nowhere to eventually become an indelible part of music culture and the moment’s dialogue. It was only a matter of time until they became the influencers of a new generation of music makers, but one can never truly “anticipate” an act’s impact. That’s what makes Vista Kicks so special. 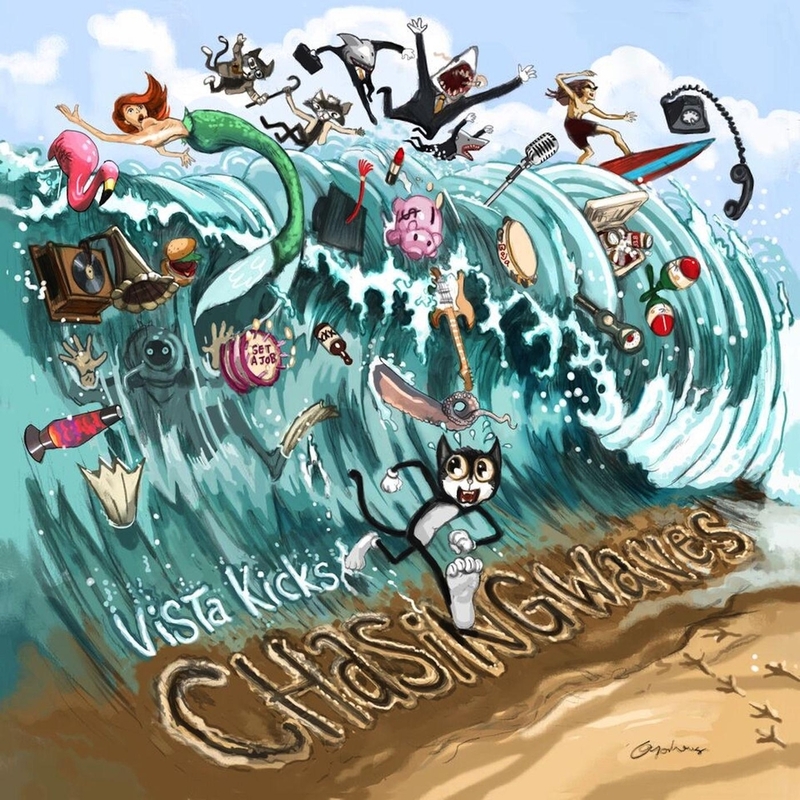 Vista Kicks independently released their debut Chasing Waves EP on April 22, 2016: That’s the most concrete, factual information I know about this band. I have yet to look them up, but when I stumbled across their EP in the iTunes Store, I knew immediately that they were something special. The moment I heard EP opener “Mona Lisa” – a great name for a song, I might add – I was hooked. Vista Kicks intentionally kick off their debut EP with five to ten seconds of fumbling around on their instruments. “Mona Lisa” opens with the jumpy, driving bass line that will support the song throughout, but around that we hear noodling on guitar, a drum roll, and even someone’s exclamation of “Alright!” from across the room – all things typically saved for bootlegs and demos. But Vista Kicks aren’t a “clean” band, and they want you to know right off the bat that, no matter how serious things get, they’re here to have fun and keep things a little sloppy. Raucous – “controlled chaos,” I like to call it. It’s planned out and intentional, and the beauty of this record is that it immediately sets a casual tone. A sweeping plunge of distorted guitar sets off a steady drum beat, and before you know it Vista Kicks are off. That driving beat turns into an infectious pulse as the lead singer croons in a steady, warm voice about a love gone awry. Insecurity, passion, and delicately subtle wordplay lift the “Mona Lisa” story off the page: The band’s vivid poetry is evocative, without being overtly emotional. That controlled chaos that started the song off comes back toward the end of “Mona Lisa” as Vista Kicks succumb to their garage rock sides. The lead guitarist trails off into a deluge of cut riffs above an explosive rhythm guitar as the lead singer goes into vocal overdrive, belting out, “You’ll never be mine…” until the song’s end. It’s a beautiful way to start an EP. Enticing and catchy, rhythmic and clever, “Mona Lisa” paints an accurate portrayal of the music to come. Vista Kicks truly are descended from the last decade’s movers and shakers: They offer the guitars of The Strokes, the vocals and structure of Young the Giant, the wit and wordplay of Vampire Weekend, and the melodic contour of acts like Red Hot Chili Peppers and Walk the Moon (Stadium Arcadium was released in 2006, so technically RHCP counts for the past decade). Atop all this, Vista Kicks somehow manage to develop a sound that feels true and authentic to themselves: They are distinctly American – a Southwest/California haze permeates their music; they embrace it, using warm effected guitar tones and plenty of reverb while also creating physical aural space in their music. For as loud as “Baja (Only Wanna Be With You)” gets, one cannot deny how much room lies between the lead guitar and the drums. 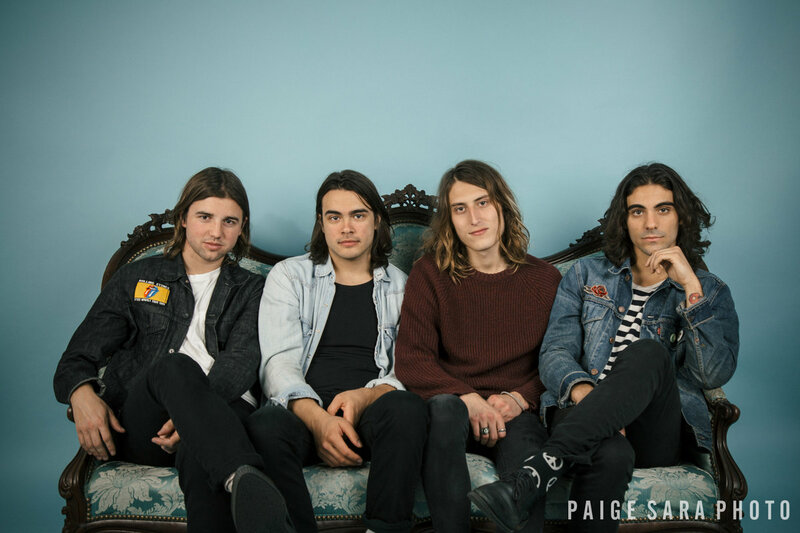 That ‘space’ – sometimes filled with little licks, but otherwise left open for breathing room – is telling of Vista Kicks’ confidence in their music’s ability to speak for itself. That’s pretty powerful for a band you’ve never heard of. Bold guitar solos and strong vocal harmonies are scattered across Vista Kicks’ EP. Second song “Waiting on You” exhibits both of these quality traits: Opening with a mesmerizing cascading guitar line that betray’s the band’s obvious Los Angeles roots, “Waiting on You” is reminiscent of the songs off Maroon 5’s debut Songs About Jane. Not that “Waiting on You” sounds anything like Maroon 5 – it really doesn’t – but the song has emotion and soul behind it; it’s driven by a pure passion for music, taking from traditional songcraft styles but leaving room for experimentation and exploration of the sonic space. Songs About Jane wasn’t revolutionary in itself – but it was cohesive, original, and freshly authentic. 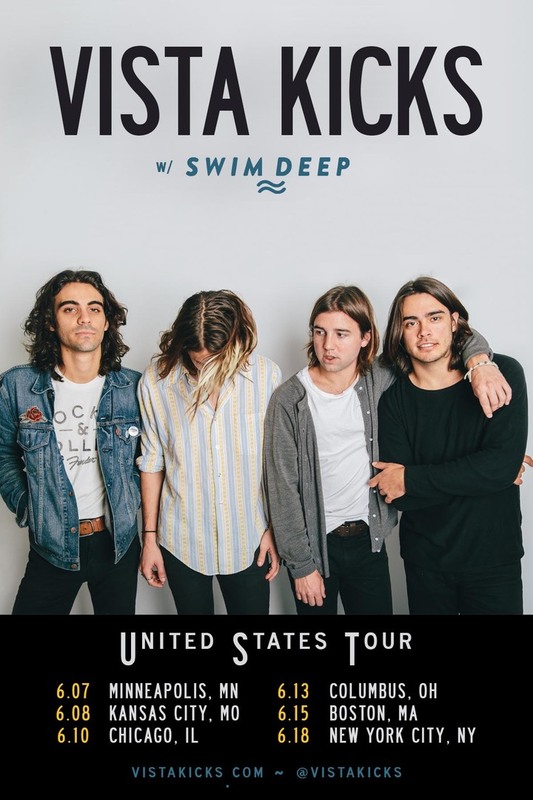 The same can be said of Chasing Waves: Vista Kicks feel at home making high-quality alternative rock that dips into their California roots, along with a plethora of musical influences. Chasing Waves tells plenty of stories: We learn about the doomed relationship that was “Marceline,” where the band’s penchant for bursts of energy find a new home in rock balladry. Surf punk meets the alt-rock scene on “Jack Revell,” an ode to excess that Sublime would be immensely proud of. The ultimate story Vista Kicks tells is their own: EP closer “Chasing Waves” is an intricate, introspective exploration of self-worth. “Chasing Waves” hints at the highs and lows of the individual human experience, reaching musically to achieve those same feelings through its Dark Side of the Moon-esque two-and-a-half-minute instrumental outro. Why bring Pink Floyd into this? Because Vista Kicks succeed at affecting and enhancing emotion through complex, slightly spacey music with psychedelic (and what I call California ‘laze’) undertones. They establish a numb moment when their heavy, hard-hitting song stops. That numbness slowly regains consciousness as the band build the song up, led by their lead guitarist’s Satriani-like emotive control over the electric guitar. The performance is magical, showing the promise of a band who, admittedly, are “only chasing waves.” We’ll chase those same waves with you, Vista Kicks, if it means getting more of this music. I have yet to know the names of the members of Vista Kicks. I have yet to confirm where they’re from (though at this point I’ll feel a fool if they’re not Californian). Soon I will discover their names, probably read a bio or two, and be irreversibly biased because I know their story. At this point, Vista Kicks are just the music for me: Pure and simple, I know them through their EP and through that alone. Vista Kicks are not to be missed this spring and summer. Chasing Waves is the perfect soundtrack to a sunshine-y day, but its layers of depth – both lyrical and musical – transcend individual day-to-day moments in the way that a Wilco album is sort of perfect for all settings. Heralding a new generation of alternative/indie rock, Chasing Waves has all the warmth, the fun, and the strife of a young band reeling from the unadulterated struggles of being twenty-somethings just trying to get by in a fucked-up twenty-first century world. Don’t miss Vista Kicks. They’re my best find of 2016, and the year’s not even half over. PS: Turns out Vista Kicks (formerly BABE) will be on tour throughout June. Also, I was right about Los Angeles.